I have been a collector of military weapons for most of my life, specialising in full-auto for the last 25 years or so. 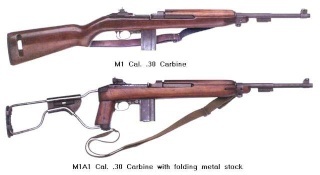 I currently own 4 carbines; 1st issue M1 by Inland, 1st issue M1A1 by Inland, 2nd issue M1 by Saginaw, and an M2 by Inland. Over the years I have owned and used many carbines, and worked on a lot more. I am a full-time gunsmith (since 1969) and do a lot of restoration work on military weapons. This usually means rebuilding them back to original after they have been "improved" by previous owners! I also manufacture museum-grade, all-metal MG replicas for the collector and movie market. I have restored some military vehicles and have been involved in the Wanaka and Omaka air shows for some years as a re-enactor. I am based in North Canterbury. Welcome along woodsy, I hope you don't mind but I put on a couple of pics of your display that was at the Antique arms auction on the weekend. I Look forward to your wealth of knowledge helping some of us here in NZ possibly answer some of our questions. Great to have you with us Woodsy. I look forward to talking to you. I'm sure you will be able to contribute a lot to the board. Mike, Wellington.